A moving supplies checklist can help you feel in control of a seemingly overwhelming process. Don’t lose sleep over whether or not you remembered to buy packing tape, and don’t waste money buying 10 rolls by accident! You can buy packing supplies at a local moving retailer, a mail service store, or an office supply outlet, but for the best selection go online. By taking a little time to surf the Internet, you can compare prices and find specialty items that may be hard to find at a local retailer. If you are an Amazon Prime member, two-day shipping is free! You can also order all of your packing supplies online via our Packing Supplies Center. All orders are shipped straight to your front door, and orders over $25 are shipped for FREE! You have better ways to spend your hard-earned money and time than on overpriced packing provisions last minute. Stress less – we’ve compiled a checklist for you! Please note that it is most appropriate for the average four-person household. A little moving help never hurts; all you need is a pen. To save money, grab professional-quality boxes from grocery stores and liquor shops. It’s best to inquire with the store manager a few weeks in advance so he or she can put aside what you need. Also, find out when the store gets big shipments and ask what time they will finish unloading. You can check for free moving boxes offered within your community through Craigslist and Freecycle. Dish Boxes/Barrels – Heavyweight boxes for delicate items. Mirror/Picture Frame Boxes – The answer for safely moving pictures and mirrors. Wardrobes – It’s easy to care for all your suits, dresses, jackets, coats in these sturdy, moveable closets. After your move, you may wish to use these roomy boxes for basement and attic storage. 15-20 Small Boxes – Perfect for heavy items like books. 10-15 Medium Boxes – All-purpose boxes for kitchen gadgets, toys and knick-knacks. 10-15 Large Boxes – The right choice for lightweight bulky items such as down jackets and bedding. Another alternative is to purchase a moving kit that has a set number of boxes and supplies which have been estimated to support the type of move you are planning. 12″ Stack Wrapping Paper – Don’t risk wrapping your things in ordinary newspaper because ink can stain your hands and possessions. Do you really want to re-wash dishes after your move? Instead, use plain wrapping paper to keep items clean and cushioned. Furniture Pads/Blankets – Use pads and blankets to wrap hard, bulky items like tables and chairs that may come into contact with other items. Blankets are a cheaper alternative than furniture pads. Both are inexpensive compared to the damage that can be done to uncovered furnishings. 9 Cubic Feet of Packing Peanuts – So your items stay secure in those boxes during transit. 2-3 Large Pieces of Cardboard – Large pieces of cardboard are ideal when used as padding between fragile goods or to protect hardwood floors when moving in and out. (Leftover boxes also can be cut and laid flat). Carpet Protector – Moving companies use these commonly. They protect carpets from damage during transport. The plastic sheet with light adhesive backing is rolled onto the carpet in strips, and is helpful for heavy traffic areas. 1-3 Furniture Covers – Protect your upholstered furniture from dust, moisture and dirt en route. 250 ft. of 12″ Wide Bubble Wrap or Foam Wrap – Helps your delicate belongings avoid damage. Bubble wrap is a cheaper alternative to replacing heirloom china or crystal ware. Gloves – Protect your hands from cuts, punctures and pinches. Use heavy-duty gripper gloves with rubber coating if possible and remove them when handing slippery items such as glass table tops. 4-5 Rolls of Packing Tape – Buy in bulk, because you’ll need plenty of strong tape for packing boxes so your worldly possessions don’t go tumbling. It will also come in handy around the house! Tape Gun/Dispenser – This clever tool saves time by ensuring you won’t lose track of the end of the tape roll. 4-5 Sets of Rubber Bands/Straps – Armoires or cabinets with doors that swing open should be secured before you move them. You can put a blanket around the item first so the band doesn’t damage the furniture. Padlock – If you plan to stop along the way, be sure to lock the cab and securely fasten the doors of your moving truck with a quality lock. Wide – Wide shrink wrap is useful for repackaging large items such as appliances. Use cardboard or a moving blanket and then secure with shrink wrap to avoid scratches and dents. Narrow – Narrow shrink wrap is excellent for bundling long, skinny items such as curtain rods and shovels. 4-6 Thick Markers/Sharpies – Mark the contents of each box and which room it will go in. Utility Knife/Box Cutter – A sturdy knife or box cutter will save time when you need to cut tape, rope and cardboard during packing and unpacking. Rope/Bungee Cords – Keep it together on moving day! These are great for tying items together or securing items on the truck. Back Band/Brace – If you didn’t hire professional movers, you will do a lot of lifting. Remember to bend at the knees and keep your back straight while lifting. A back band / brace can give you extra support. Forearm Lifts – A forearm lift is a heavy strap that wraps around your forearms and allows you and another individual to carry awkward, heavy items without having to lift them high. Toolkit – Hammers, screwdrivers, wrenches and sockets will help you disassemble furniture for transport. Bring a selection of common-size Phillips, flat-head, Allen, Torx and nut driver bits. This will reduce the time it takes to disassemble and reassemble beds, dining tables, etc. 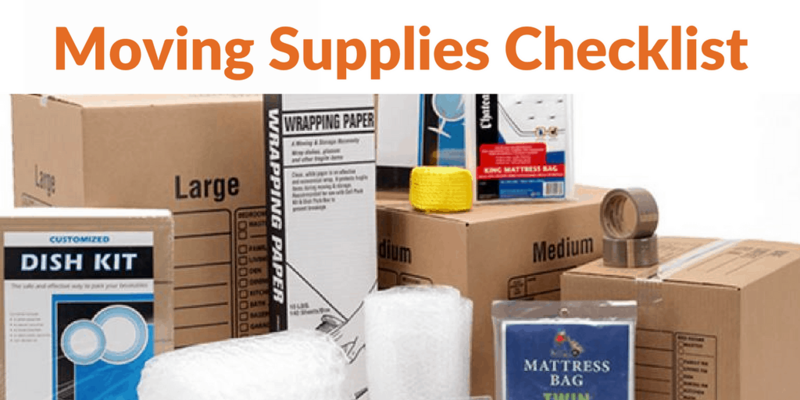 A moving supplies checklist can keep you on track, on time and on budget! Simple Moving Labor wants your move to be smooth and stress-free. Have you used any handy supplies while moving we didn’t mention? Has this checklist helped you? Feel free to let us know by commenting below! Do you have a friend who’s moving? Share this article with them Facebook or Twitter!